It is a truth universally acknowledged that if I put a book or movie on my respective to-read or to-watch lists, it'll probably sit there a while. And watch Austenland starring Keri Russell and JJ Feild. Talk about two birds and one stone. I felt like I was in my own book club during the couple of days I spent reading the story followed by a quick trip to Redbox to get the movie. But which was better? The book or the movie? Usually in scenarios such as this, I have a clear front-runner. (It's almost always the book--no surprise, ey?) But in this case I'm split. There are parts I liked better in the book and ones I preferred in the movie. If I could splice them all into one finished product, I'd be deliriously happy. The movie stayed pretty faithful to the source. The only big differences were the beginning (which I liked better in the book) and the ending (which I liked better in the movie, though the book was pretty cute). In general, I'm still satisfied with the overall impact of each. For a Jane Austen fan like myself, what I loved most was the general concept of the story. I mean, how awesome would it be to go somewhere like Austenland? To be at a place where you could pretend to be Elizabeth Bennet or Emma Woodhouse, and be wooed by the likes of Darcy, Knightley and Wentworth. It's a dream. But on top of letting the heroine live her dream, both the book and movie show what happens when you realize the dream isn't what you thought or it isn't enough. 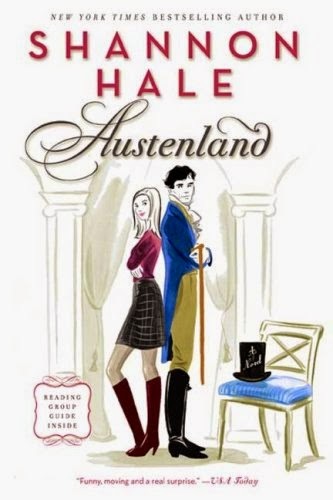 Has anyone else read/seen Austenland? What did you think? willst thou take this blog post? happy birthday prize package giveaway!